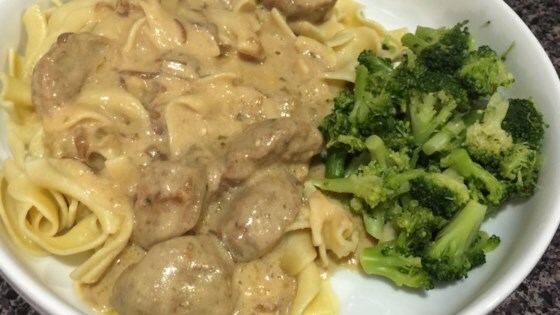 "My friend Anna makes the most amazing and easy meatballs with gravy! Prepared in a slow cooker, this recipe couldn't be any easier! Serve over buttery hot cooked noodles and you'll have a happy crowd! Mangia!" In a large slow cooker, mix together the cream of celery soup, French onion soup, and sour cream. Stir in the meatballs. Cook on high heat for 3-4 hours. Bring a large pot of lightly salted water to a boil. Add pasta and cook for 8 to 10 minutes or until al dente; drain. In a large bowl, toss the pasta with butter. Serve meatballs and sauce over the cooked pasta. Hubby was not that impressed with it. Taste was okay......basically like meatballs in soup.Very easy and quick to prepare, but I would not make again. This is a wonderfull dish. I halfed this recipe and it came out wonderful. There was enough liquid. I would recommend this for any potluck no noodles needed.